This spacious 2 bedroom, 2 bathroom corner unit was completely remodeled the summer of 2017. It has all new luxury vinyl wood flooring, upgraded bathrooms and kitchen, professionally decorated with high end furnishings and freshly painted in soothing grays and blues. The views from this condo are absolutely incredible! It has a wrap around balcony and wall-to-wall windows offering the best water front views on the island! As you prepare meals in the modern kitchen or relax in the comfortable living room, you can look out to see the dolphin play. The living room has a sleeper sofa, large flat screen remote TV with DVD player. The kitchen is fully equipped, all your bed & bath linens, beach towels and a full size washer & dryer are included in the condo. The master bedroom has a walk-in closet, a private bathroom featuring a high double vanity, walk-in rain shower with teak corner shower seat and safety grab bar. The bedroom is decorated in Pottery Barn furnishings with a king size bed, TV, and a desk where you can conduct business as you gaze out to the beach. The guest bedroom has a double size bed and a twin bed, remote TV, and a private bathroom. The bathroom features a deep tub/shower with a safety grab bar and high granite top vanity. You may also relax on the beach front ground level patio which has a table with chairs and Adirondack chairs. The owner provides complimentary WiFi and a storage room located ground level where you will find beach equipment to use at the beach. This is a "pet friendly" property (additional fees will be applied). This unit recently remodeled has excellent lighting, laminate flooring and is pet friendly. The Clarks demonstrated very good taste with beach resort accents. The kitchen is modern, there are extra towels and bedding materials. The views from sunrise to sunset are stunning. 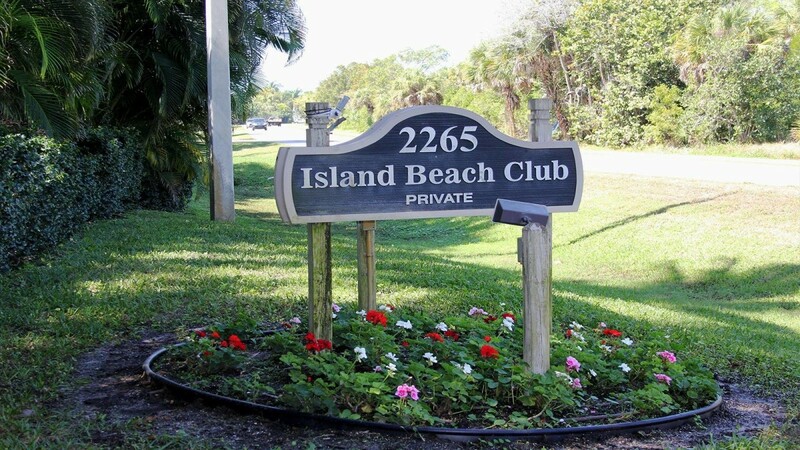 Parking along with guest spaces is ample at Island Beach Club, close to Bailey’s and Jerry’s on West Gulf Drive. The owners left books and jigsaw puzzles for guests in the event of bad weather. Mature guests may purchase lifetime passes to parks such as Ding Darling for $10 and bicycle rentals are inexpensive. Our dachshund Oskar loves 260D and is looking forwark to his visit next year. He probably thinks he has a 20X9 television screen for his own use. The green space downstairs is ideal for dog duties. IBC 260D is far and away our favorite rental on the island, and doubtless it will be yours as well.